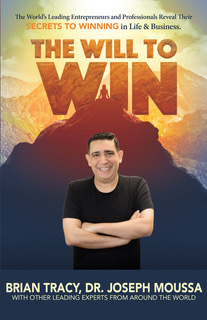 Joseph Moussa ranked on Amazon best-seller list with the new book, The Will to Win, co-authored with Brian Tracy. MONTCLAIR, N.J. - Oct. 5, 2018 - PRLog -- FICOI and Owner of Montclair Dental Spa, Joseph Moussa, joined a select group of business experts and entrepreneurs from around the world, along with success expert, Brian Tracy, to co-write the book, The Will to Win: The World's Leading Entrepreneurs and Professionals Reveal Their Secrets to Winning in Life and Business!! The book also features content from JW Dicks, Esq. and Nick Nanton, Esq., international Best-Selling Authors® and marketing experts. The book was published by CelebrityPress®, a leading business book publisher that publishes books from ThoughtLeaders® around the world and was released on 8/30/18. On the day of release, The Will to Win reached best-seller status on Amazon - reaching #34 in the "Direct Marketing" category. The expert information in Joseph Moussa's chapter, "The Will to Smile Again.. You Have Options!" helped the book reach best-seller placement and will help readers gain similar success in their endeavors. CelebrityPress® describes the book as an inspiring guide to find the will to win and to use these CelebrityExperts® around the world who have made successful journeys to their chosen goal(s) and have discovered what works and what doesn't as your mentors. Winners are individuals who surpass the efforts of all others and can claim victory in their competitive endeavors. There are more famous quotes on winning and succeeding than on most other topics combined. Many of these have come from a variety of thinkers, coaches, philosophers and scientists including Confucius, Socrates, Gandhi, Martin Luther King, Einstein, Stephen Hawking, Vince Lombardi, John Wooden and 'Bear' Bryant. It is interesting to note that while great thinkers and coaches view winning as their goal, they emphasize that preparation for the event is of even greater importance. This has never been more evident, where competition to rise to the top is pursued by so many and winning is revered by all. The result of this intense competition is that winners are analyzed meticulously. Along with the potential rewards of fame, wealth, public recognition and power, aspiring to win can easily become emotional and personal, and our determination to succeed amplified. The CelebrityExperts® in this book are here to guide those who wish to succeed. Having made the journey themselves, they know the paths to choose and those to avoid helping you navigate the road and find your will to win! After such a successful release, Joseph Moussa will be recognized by The National Academy of Best-Selling Authors™ (http://www.bestsellersacademy.org/), an organization that honors authors from leading independent best-seller lists. A portion of the royalties from The Will to Win will be given to Entrepreneur's International Foundation, a not for profit organization dedicated to creating awareness for charitable causes. Joseph Moussa, DDS, FICOI, Owner of Montclair Dental Spa, in Montclair, NJ has been changing people's lives with his gum rejuvenation, implant dentistry and full reconstruction of smiles for over 20 years. He graduated from Damascus University College of Dentistry; the oldest and most prestigious University of it's kind in 1993. He served two years as a Lieutenant in the Army performing Dentistry in the clinics and hospitals. He then enjoyed a very successful practice abroad for seven years, but felt as if something was missing. He fell in love with a branch of Dentistry that was up and coming, he craved to know more about implants and the science of Implantology. He chose to leave his home to learn more about the field of Implantology and Dentistry in America. He was accepted to the difficult curriculum of New York University Dental School to hone his skills and to satisfy his need to know more about implants and Cosmetic Dentistry. He graduated in May of 2003 at New York University. His professors were so impressed with his skills and desire to learn, they offered him the position of Associate Professor of Implantology in the post-graduate program of New York University Dental School. Dr. Moussa has dedicated many hours to training in one of the most prestigious programs on the east coast for Esthetic Dentistry. Training includes porcelain veneers and full porcelain restorations. His training and desire to perform the best Dentistry possible, drives him to continue to stay involved with the University, to increase his dental knowledge with many continuing education courses. His passion for Dentistry and compassion for patients proves to be a successful combination. He maintains memberships in some of the prestigious academies such as: FICOI, Academy of General Dentistry, American Academy of Implant Dentistry, International Congress of Oral Implantology, and the American Academy of Cosmetic Dentistry. He recently achieved his highest-level of certification as a LANAP Regenerative Specialist. His belief in a more natural approach to dentistry has lead him to become a well known "Biological" Dentist in the state of NJ, being a member of The International Association of Mercury-Safe Dentists, International Academy of Biological Dentistry and Medicine and The International Academy of Oral Medicine and Toxicology.